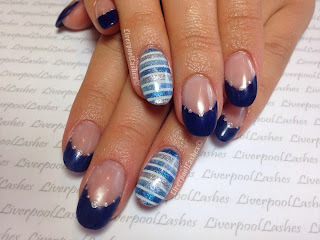 Yesterday I had a little bit of play with some striping tape and ended up creating the faded stripes that I posted about yesterday (click here to read the tutorial) Rachael was booked in for today and as I knew she had seen my post yesterday, I had a little bet with myself that she would want the faded stripes and I was right! I actually did something a little bit different than usual and the blue used for the tips was a mix of CND Additive in 'Deep Blue' and acrylic powder. I then mixed CND Shellac in Clearly Pink with CND Additive in ' Pave Diamonds' for the dots along the smile line. CND Shellac in Cream Puff was applied and cured to the ring fingers. The shades I used for the stripes were CND Additive in Pave Diamonds, Amethyst Flash and Midnight Tide using the method here. I do feel like I say this about every set but I really adore the colours and overall design of these nails. The mix of the different coloured stripes compliment each other perfectly and I think Rachael was delighted!